Cordials are very hard to do in this modern day due to the restrictions of distillation. In the United States, both Alcohol and Tobacco are taxed but you can grow your own Tobacco without fear of the government shutting you down. 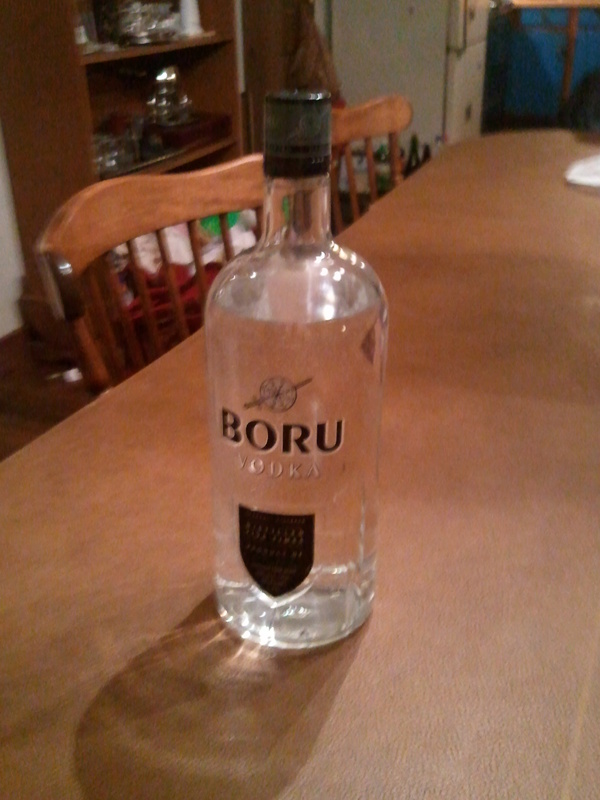 Not so much with alcohol. Distillation (or moonshining) is a felony . 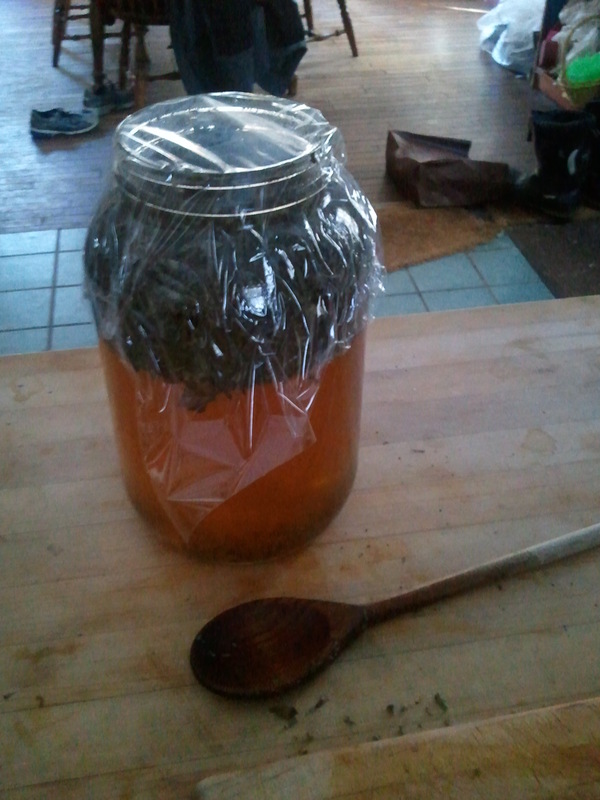 If you have 10,000 dollars and 5 years to spend in prison than I highly recommend you try distilling without a license. Is it likely you’ll go to prison? It’s hard to say. 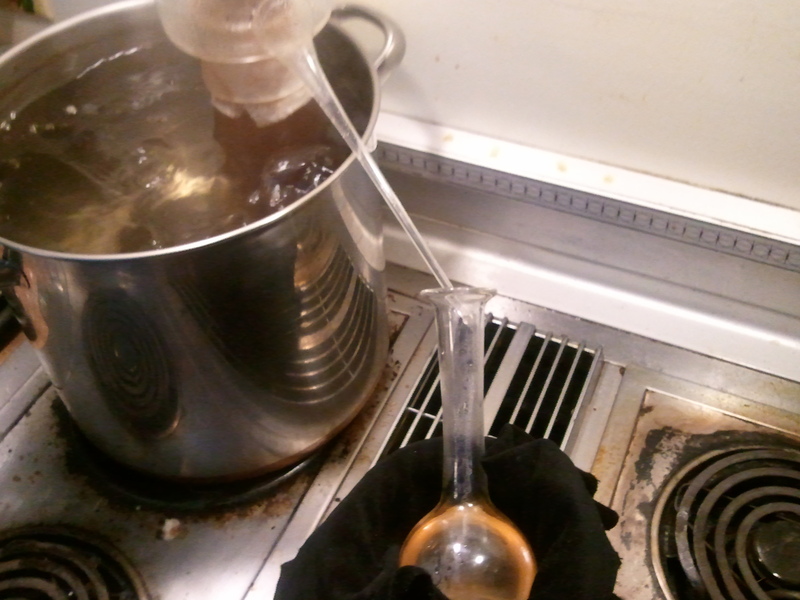 The individuals I’ve spoken to about it claim that the small amount of home distillation you do wouldn’t be enough to pay one ATF Officers salary for a week. They want the big producers who are flooding the market with illegal whiskey and vodka. Be that as it may, I still caution you do not distill alcohol. Back in 1600’s Hugh Platt and Sir Kenhelm Digby had no such laws to worry about. They distilled in simple pot stills to produce both essential oils and alcohols with delicious flavors. Cordials were considered medicine in their time so to cure a raspy cough or when one felt under the weather, a cordial was prescribed to alleviate the illness. It was only later that cordials became pleasurable accompaniments to drink. This put me in a rather strange juxtaposition. On the one hand, we had these wonderful recipes from medieval times which I could not produce due to law and on the other hand, I have a cordial category specified by the East Kingdom Brewer’s Guilde which tends to run low scores due to the fact that several categories are compromised. If we did the standard Dibgy recipe it devolves into take fruit, freeze it and add vodka. Shake 2 times in 2 weeks and then sweeten with sugar syrup until just below perfect. Cap and let sit for atleast one week. This recipe never scores high. You can only hope that by changing the original fruit and replacing it with another documentable fruit, that one of the judges may give you extra points for creativity. I was in the shower when inspiration struck. My wife has a bar of green tea soap which is fragrant but with the hot water in the shower becomes downright overpowering. I was thinking about my next EK Panel entry when I get hit with the green tea soap smell and something clicked in my brain. If I couldn’t get credit for full distillation, maybe I could get credit for half. It was at this point the shampoo ran down into my eyes and I spent the next 15 min rinsing away the pain. But I digress……. A quick distillation of rosewater: Pound the rose petals to be bruised so that the roses will express the moisture inside. 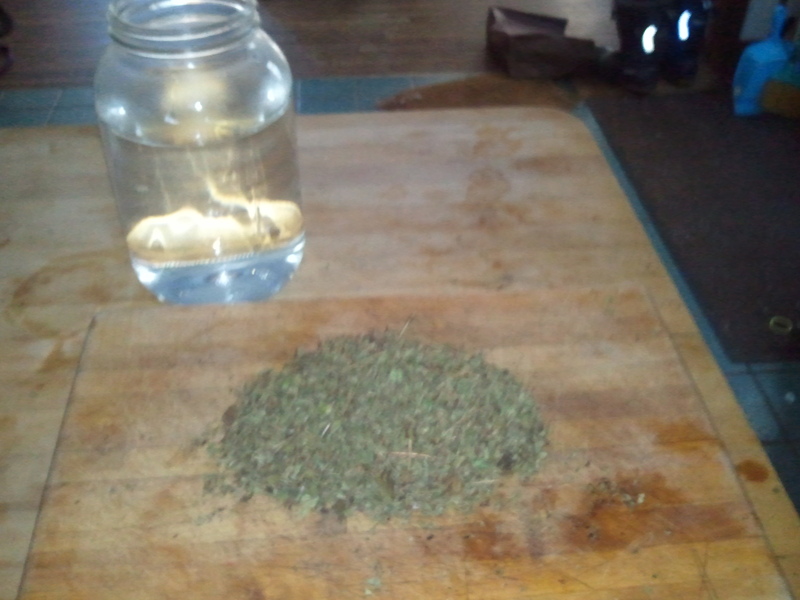 Collect the moisture and then soak the leaves in water to distill equally. 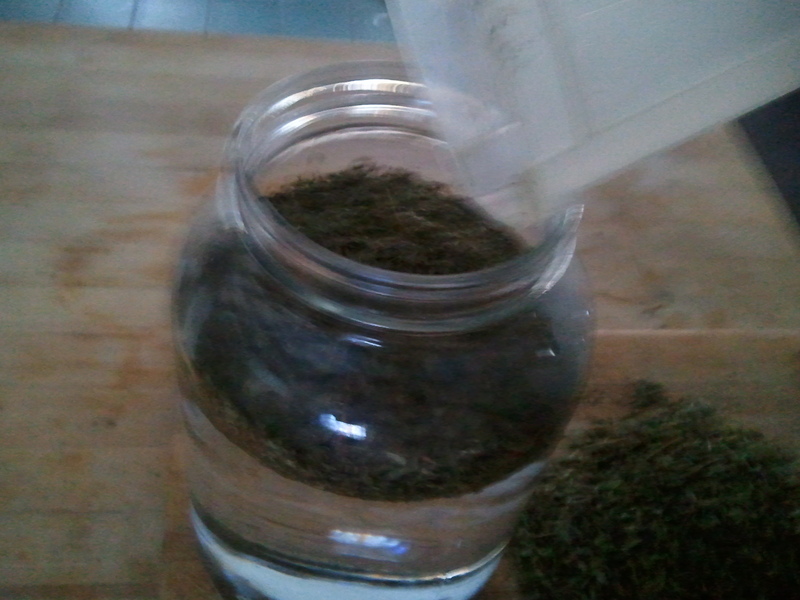 This water is equally useable for medicine and/or liquors (such as cordials). 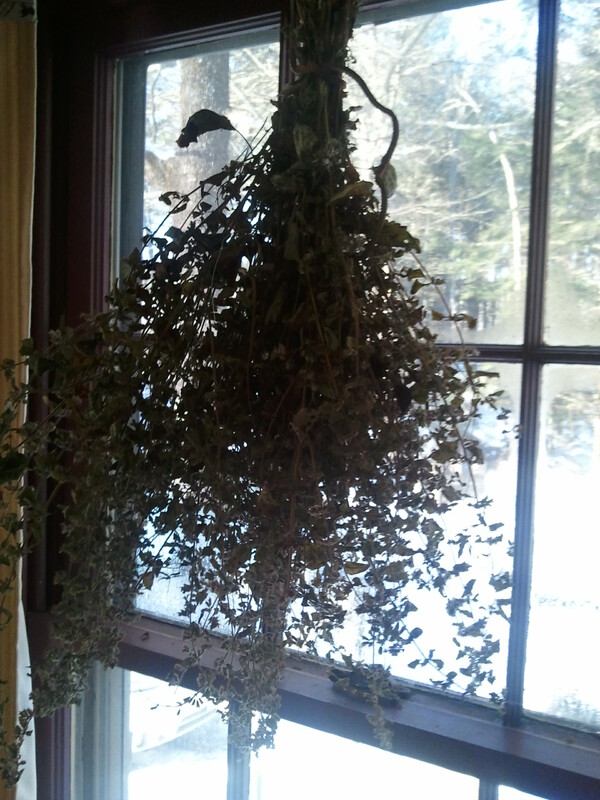 The Lemonbalm and Mint were harvested from my own garden this year and hung upside down to dry for 2 months. 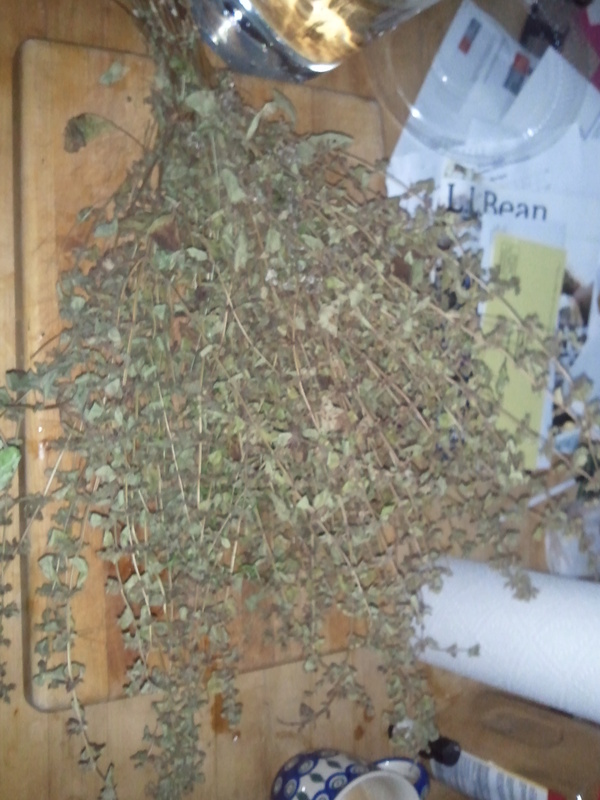 At the end of this period, the leaves and stems were seperated and the stems discarded. The leaves were crumbled into small pieces and soaked in a water solution for 48 hrs which allowed the leaves to express the concentrated oils into the water. THERE IS NO ALCOHOL BEING PRODUCED. 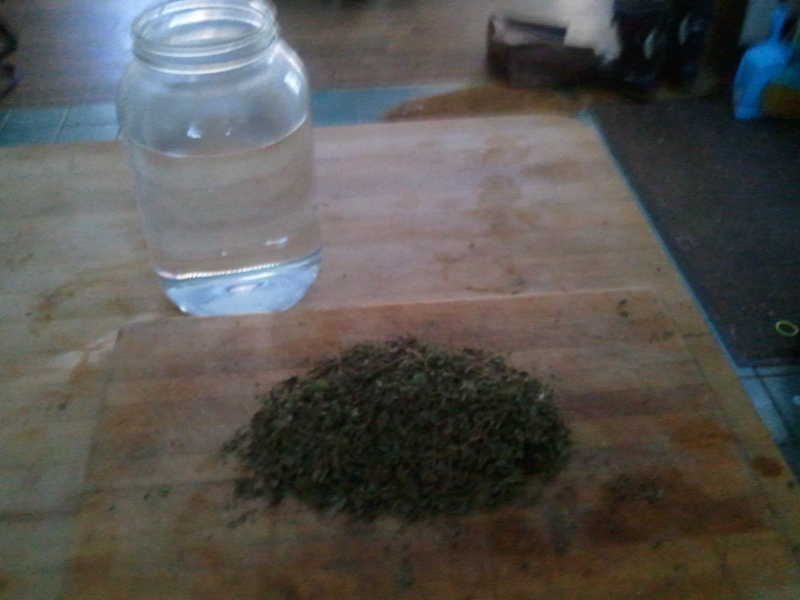 THIS IS A WASH.
48 hrs later, the “tea” or “wash” is ready to be separated. 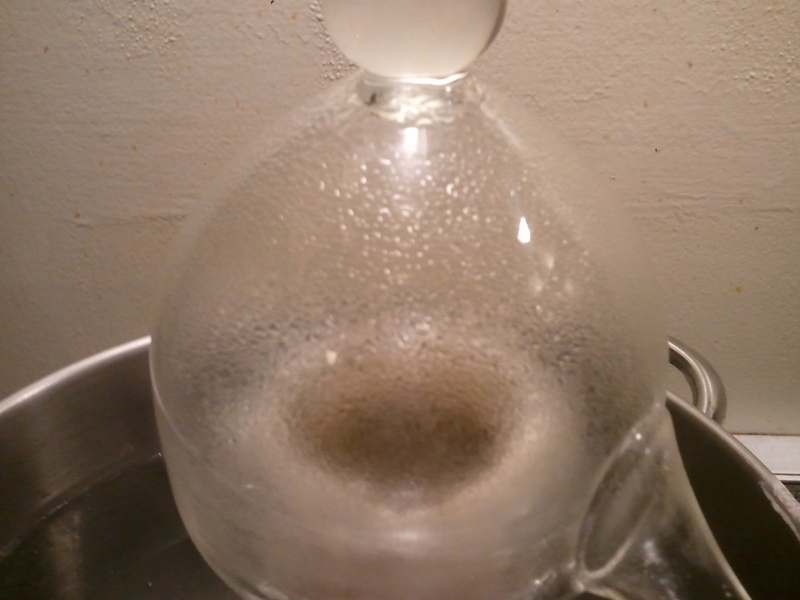 Once the wash is in the beaker we put the alembic on top but we want to seal the glass so that none of the essential oils escape. 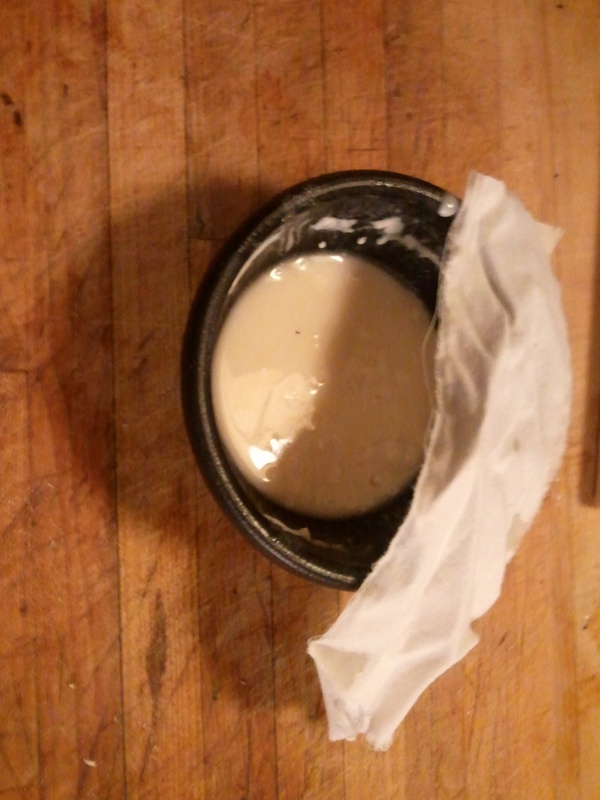 For this it’s recommended that rye flour be used but I used a combination of regular flour with water and then dip a muslin sheet into it. 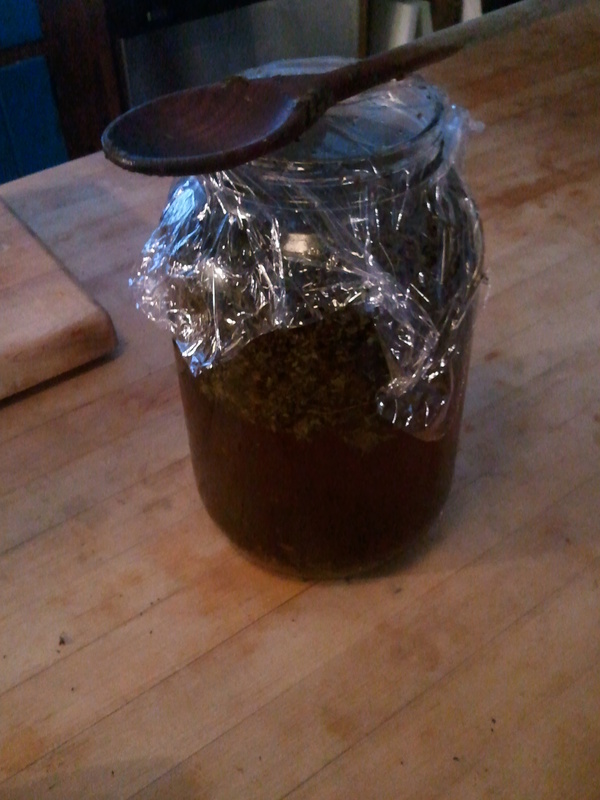 This is then wrapped around the neck and the alembic is put on top creating a seal. 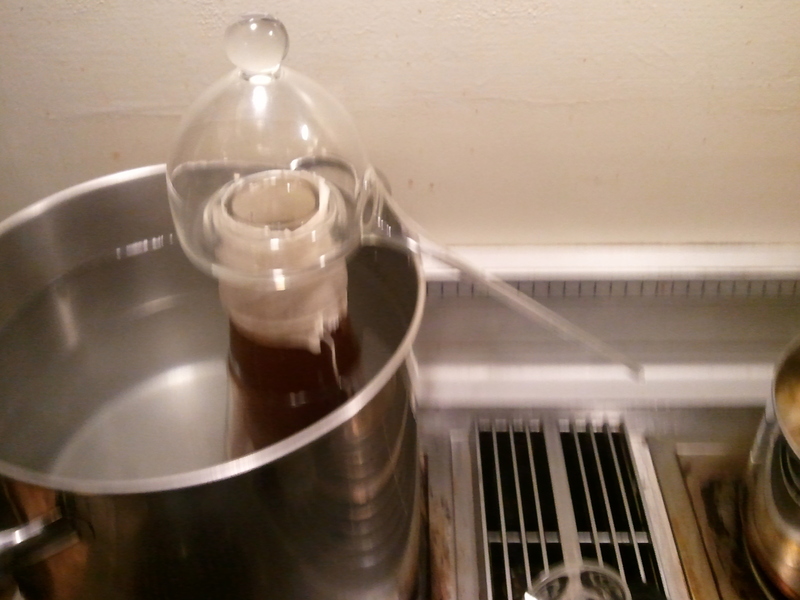 The water bath that the alembic is put into goes almost up to the muslin sleeve. 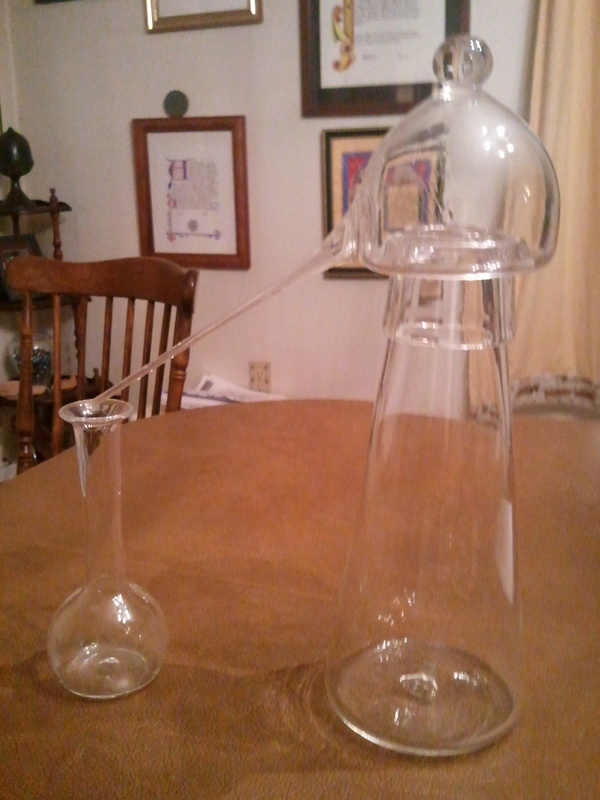 There is a trivet in the bottom that the beaker sits on. The wash was then brought to the boiling point. From which over the next several hours, the oils of the mints were extruded from the wash and decanted into a holding container. Collection happens over the next several hours. A slight bit of color is extruded as well. After a sufficient amount of the oils are extracted, they are combined with a legally distilled spirit and tasted. If the flavor is overpowering, sugar and more water can be added. In this case, the flavoring was very delicate so I wanted to make sure it came out during judging. 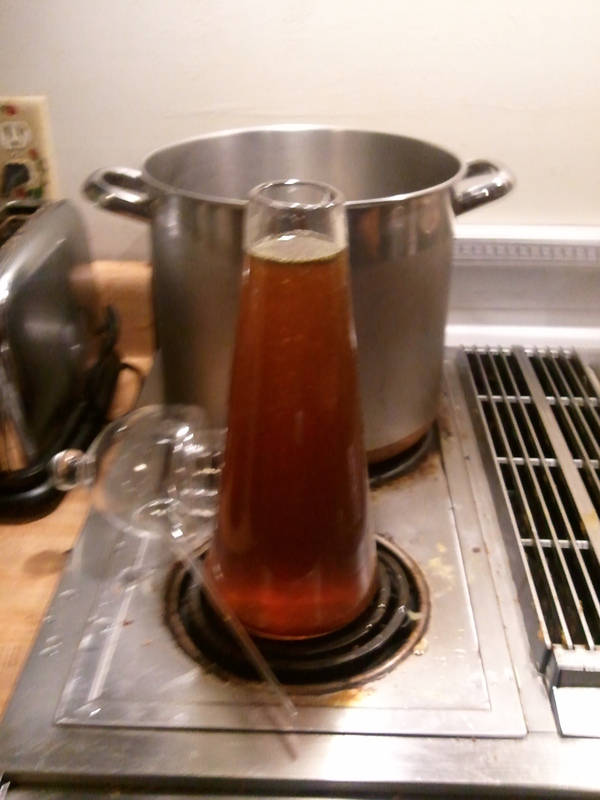 I ended up adding the aqua vitae and then mixing about 2 tsp of sugar into the mix and tasting. 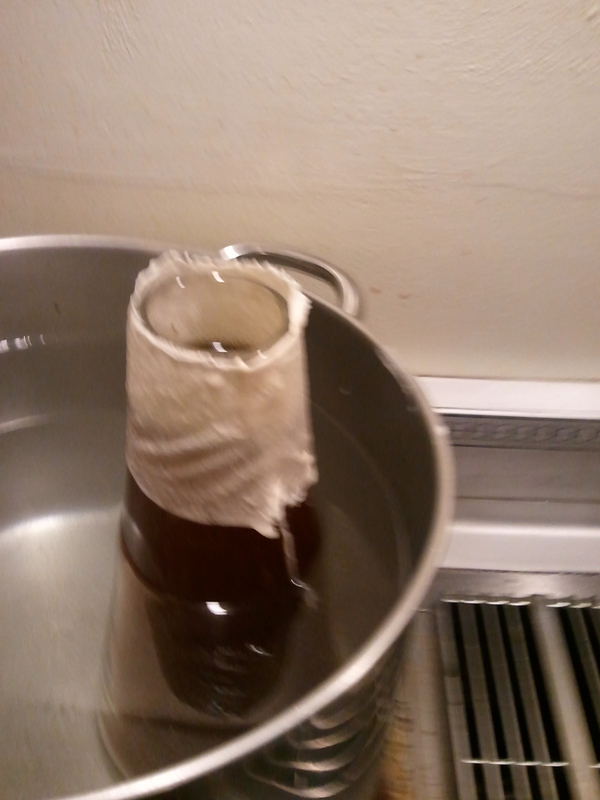 When it was slightly below perfect I bottled the mix and let it set for 2 weeks. 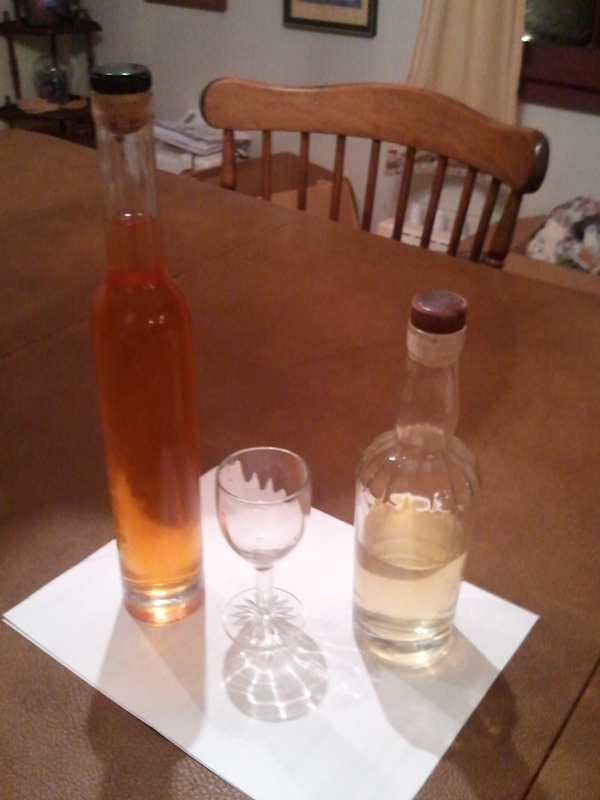 I actually entered 2 cordials and received scores of 78 (Quince w Lime) and 79 (Lemonbalm w mint). Both were excellent scores although I thought the Lemonbalm would have outpaced the Quince by much more. It was agreed all around that the dried leaves probably weren’t the best choice and we wanted to see what differences the fresh bruised leaves would have in comparison. Suffice it to say by following close procedure, using period equipment, the goal of creating an essential oil which can then be tranferred into a neutral spirit and sweetened following 2 recipes both in period and possibly able to be on the same shelf of someone’s kitchen at end of period, was achieved. 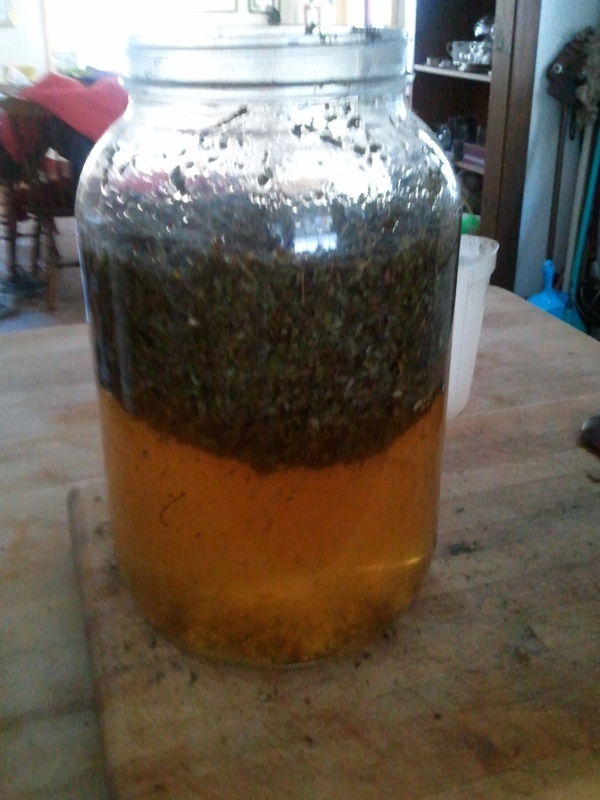 I believe this is a more period technique for creating cordials although being my first attempts I would go back and consider using fresh herbs instead of dried to see if the flavoring was more robust in comparison. Kenelm Digby. The Closet of Sir Kenelm Digby Knight Opened (Kindle Locations 1994-1996).